This is still a thing, I haven't forgotten about it. Been busy with IRL shtuff'n'things. Level one is now rebuilt in the new tileset, Level 2 is following closely behind. 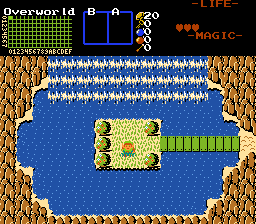 The Overworld up to the entrance of Level 3 is built. New Midis, caves and puzzles for levels have been and are being added, to separate this from the original quest. Heart Pieces will now replace ALL of the heart containers from the original quest (aside from bosses of the typical main levels), still adding up to 24 total hearts that can be gained for the life bar. Each Level will now have a minimum of one or two puzzles using the main item gained for specific level. Fixing up the hookshots so they will actually have differences (For some reason, the chain extension length was the same for both in all directions). New areas are in the works! Examples include caves mostly, though I am considering adding trials that you may have to complete to proceed to later levels. I will give a demo when I see fit, likely after I complete building Level 4. The mindungeon holding the Lens of Truth is now revamped and built.